In Florida I visited two manufacturers of amphibian kits, Progressive Aerodyne and Arnet Pereyra, and had demo flights in their two-place side-by-side amphibian kitplanes. Both airplanes are high wing pushers, built like ultralights, but weighing over 800 pounds empty and with useful loads of about 550 pounds. The two planes are similar--both are improvements on the Buccaneer--but differ in several interesting ways I'll save the comparing and contrasting for later, though, and get right into the fun stuff. 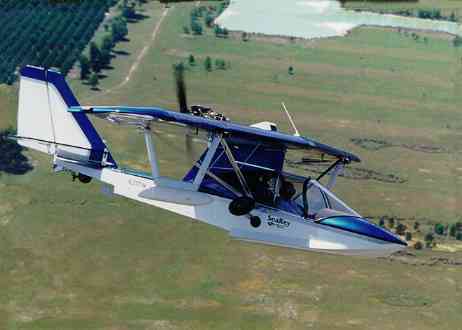 Kerry Richter took me up in the Progressive Aerodyne SeaRey. From his factory in Orlando we drove 15 miles or so out in the country to an ultralight park beside a lake. There were about 50 airplanes there, most of them amphibians, nearly all of which were SeaReys. Kerry rolled one out, topped off the 18 gallon tank with premium motor gas (which the four-stroke Rotax engine likes better than 100LL avgas), and preflighted it. We climbed in, and he fired up the engine. He taxied to the downwind end of a pasture and opened the throttle. The SeaRey rolled about 350 feet on the long grass, rotated at 50 mph and climbed out at 70 mph, making something like 700 fpm. At maybe 200 feet he rolled into a 60 degree bank and turned toward one of the several nearby lakes. On the way to the lake, he had me do the flying, and I found the controls light and responsive. The plane was much easier to fly than a Cessna 152, although it didn't roll quite as rapidly. Stalls were gentle and even. With the stick held all the way back, recovery was automatic--the nose dropped on its own, the SeaRey accelerated a bit, and then because the stick was still all the way back, it nosed up into another gentle stall. The only difficult thing for me was getting the feel of the pitch--and that was because the nose is so short and low that the horizon is a long way above any reference on the airplane. Of course, it also means that the visibility is terrific. That wasn't a problem below about 100 feet, as the ground provides its own handy reference. Kerry landed on the lake--very smooth, with no bumping or porpoising--and taxied around at 50 mph on the step, making tight turns, using opposite aileron to keep the inside wing up. When he crossed our wake there was a little bumping, but less, it seemed, that you'd experience in a powerboat. He said you can operate comfortably in one-foot waves, but that in rougher water you get bounced pretty hard because the hull is rather flat, to keep the takeoff distance short. When I tried taxiing on the step, I first got in too much aileron, but soon got the hang of it and found that the SeyRey turned sharper than a planing speedboat. Takeoff was smooth and automatic. I really had to do almost nothing, and the SeaRey lifted off by itself. We took off and landed on another lake, where two boys were zipping around on jetskiis. They seemed tickled to have us playing with them, but Kerry took off again, flew about a quater mile away and turned back toward the lake with the throttle wide open. He went down to about 10 or 15 feet, accelerated to about 100 mph, and zoomed across the lake past the jetskiis, over a narrow bit of land, clearing the reeds by inches, and out over another lake, then pulled the stick back and climbed steeply until the airspeed bled off to 70, or so, and then leveled off. Well, the rest of the flight went more or less like that, with lots of water landings and takeoffs and lots of tight low-level turns around trees. After about an hour, we landed on the grassy pasture, down and stopped in less than 300 feet. It was, in short, an exhilarating ride. 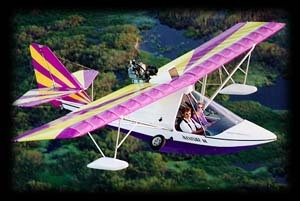 The next morning in Rockledge, a few miles south of Cape Canaveral, Jim Ratte took me up in an Aventura II. This flight was similar to the other, except that Arnet Pereyra is right on a paved airstrip, and there were alligators in the lake. We saw eight or ten of them, one at least 12 feet long. There was a guy fishing in a small boat, apparently unaware that gators were all around him. Back at the airport, Jim landed smoothly on paved runway, giving me a look at how the little planes handle on hard surfaces--although I couldn't really see any difference. The Aventura II landed straight and stopped in maybe 200 feet. What I didn't see in either flight is the crosswind handling. Kerry Richter said he'd landed a SeaRey in an 18 knot 90-degree crosswind. Whether I could do that, or not, I don't know. Even though these are taildraggers, they're pushers. Consequently, their noses are so low and they sit so close to the horizontal that you can see ahead while taxiing much better than in a tricycle-gear Cessna 152. In terms of performance, neither airplane was designed to be a speed demon. The SeaRey is somewhat faster than the Aventura II, and it climbs a bit faster. 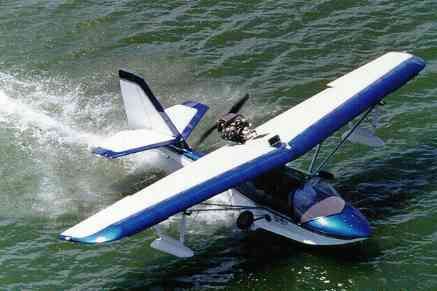 They both take off in less than 400 feet on both land and water. The Aventura II's Vne is 90 mph with the 80 hp Rotax 912, and it cruises at about 70 or 75 mph. I saw Jim Ratte get up to 95 indicated once, at about 10 feet above the lake, but the rest of the time he flew at 70 or less.) The SeaRey's top speed is 105 with the Rotax 912 and it cruises at 85. It can handle more powerful engines: with the 115 hp Rotax turbo 914, Vne is 125 mph and cruise is 100 mph. With the new normally aspirated 100 hp Rotax 912S, it will probably cruise at 90 or 95 mph. Both airplanes are pretty draggy, with lots of things hanging out in the wind, so that necessarily limits the top speed. Also, I think the ultralight-type wing on the Aventura II probably wouldn't like going much faster than 100 mph, or so, without deforming. The ribs are more like sailboat battens than ribs. The SeaRey has true ribs and a conventional wing structure and covering, and will probably stay toghether well beyond the 125 mph Vne. Both airplanes have wires--stranded cables--to brace the horizontal and vertical stabilizers. They also have a wire on each side, running from where the rear strut connects to the wing to the tail. This makes the tail very strong, but the wires are in your way when you want to get back to work on the engine. But that's the only thing I'd really like to see gone from the planes--that and maybe the awkward position of the landing gear when it's raised.. Everything else looks pretty good and works well. About the gear: both pilots told me that they recommend flying with the gear up, even when far from water. They said that it does no harm at all to land on grass with the gear up--maybe just grass stains on the hull--and it's the only way to land on a plowed field. They said that occasionally someone will land on concrete with the gear up, but all it does is grind off a patch of fiberglass on the bottom of the step. On the other hand, if you land in the water with the gear down and are going very fast, you'll almost certainly nose over and have to swim. 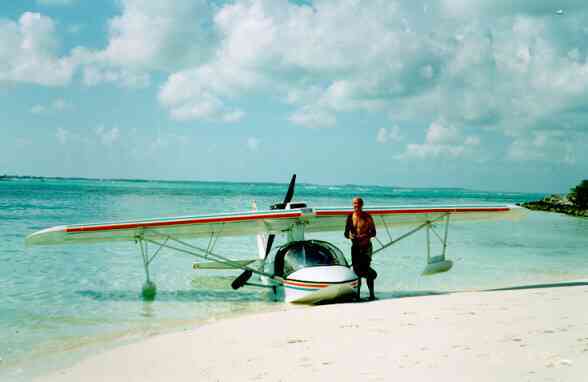 Progressive Aerodyne's web site calls the original of this picture "srbahama.jpg"--cool! I also saw an Aventura II that had just returned from a flight to the Bahamas.